Since the announcement of the Losi Desert Buggy XL 1/5 Large Scale the specs were available but numbers are not always easy to digest when not compared to what you used to looking at. 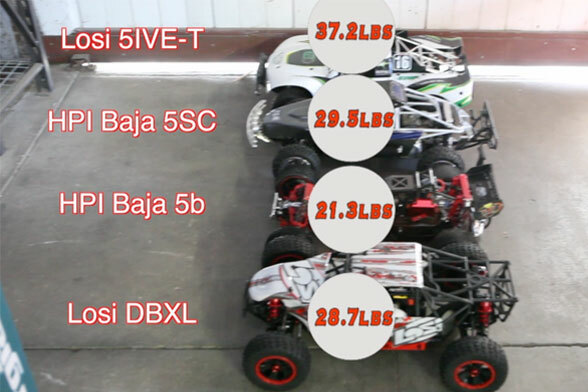 So LSN took the new Losi DBXL and compared it to the Losi 5IVE-T, HPI Baja 5SC and the HPI Baja 5B. We compare basic specs and weight and show you side by side how the cars compare. We think the new Losi DBXL is a great size, really not far off from the HPI Baja 5SC yet it’s 4WD which if you have driven a large scale 4WD then you know the excitement that can bring to large R/C bashing and racing. We will work on more videos where we compare the cars in a more technical way for those interested. You can also expect some good old fashion bash testing of the new Losi Desert Buggy DBXL. At $999.99 for a RTR 4WD Buggy from a major manufacture like Losi you can not go wrong in our opinion. Even if the DBXL needs some help in the aftermarket parts area, we still think this is going to be a winning platform for Losi and the large scale industry. Until next time….enjoy the video below. Bartolone Racing wasted no time producing the industries first Tuned Pipe and Billet Clutch Carrier for the new Losi Desert Buggy XL DBXL 1/5 Large Scale 4WD RTR. Bartolone is world famous for producing product that is in demand for those who like performance and expect nothing but the best. 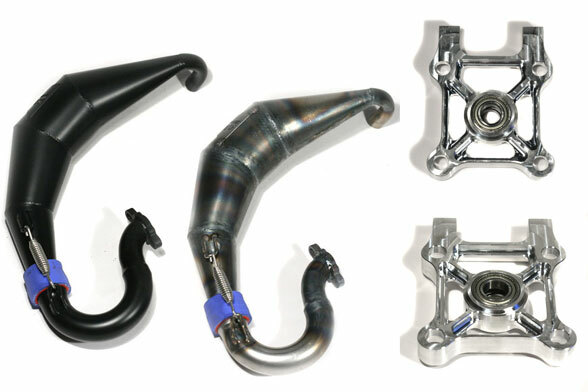 The DBXL tuned pipe will come in black, chrome, and raw finish and will bring some serious horsepower to the new Losi. The Billet Clutch Carrier for the new Losi Desert Buggy XL DBXL is a surely needed part as we all know the clutch carrier is the first plastic piece to melt and deform quickly with heavy bashing sessions that these Desert Buggy’s will be put through. So if your looking for hop-up parts for your Losi DBXL then check out the Bartolone Tuned Pipe and Billet Clutch Carrier available NOW at TGN. Losi DBXL 4WD 1/5 Scale is now shipping. Desert Buggy XL hits lucky owners! 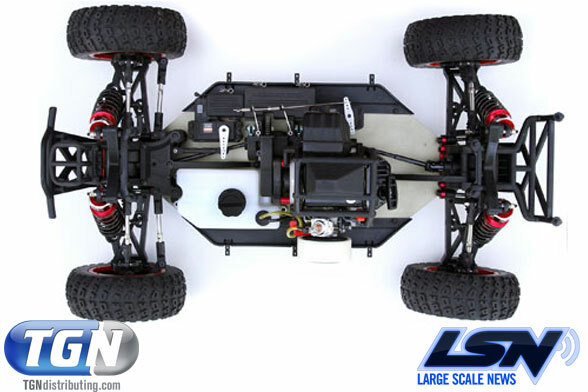 Some very lucky owners are receiving their new 1/5 Scale 4WD Losi DBXL in hand as of this week. 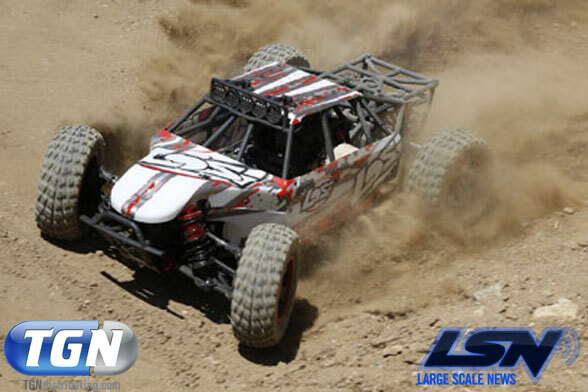 The 1/5 Large Scale market has not seen a 4WD from a major manufacture like Losi for less than the $1600 Losi 5IVE-T. The $999.99 MAP price on this new Desert Buggy XL is a major move on the part of Losi and should make some waves within our industry. We here at LargeScaleNews have received our unit from TGN, if you looking to pick up one yourself then get them now because they are still in stock and shipping within the US is FREE! Check them out! Watch our YOUTUBE channel for more informational videos and action videos of the Losi Desert Buggy DBXL 4WD large scale coming soon. 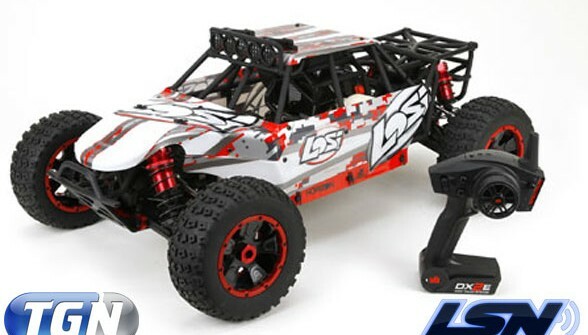 Author Posted on December 21, 2013 December 21, 2013 Leave a comment on Losi DBXL 4WD 1/5 Scale is now shipping. Desert Buggy XL hits lucky owners!